Ringing in 2019!! - wendykennedy.com inc. Pulled out of the archives……This post still rings true…I’ve been anticipating the arrival of 2019 much like a young child waits for Santa on Christmas Eve. And now it’s finally here! As we ring in the New Year, it’s important to not only look forward, but also, to look back – to reflect on our accomplishments, to learn from our successes and mistakes, congratulate ourselves on goals and milestones achieved, and then after this reflection, to become excited about what the future holds. The last week of the year I make it a tradition to set aside some time for this reflection, in between leftover turkey casseroles and the unending supply of chocolate that dawns every table in our house. I do my best strategic thinking walking with my two golden retrievers through the lush thick wooden areas by our home. The 100-year-old pine trees whisper in the wind and the snow glistens – and if I’m lucky, the sun peeks through to make everything perfect. Who wouldn’t be inspired? I’m a student of frameworks and tools – this comes as no big surprise for those of you that know me. They offer mental models that focus the often scattered and disjointed thoughts that ramble around in our heads. If we give ourselves the right conditions to let these thoughts percolate and then pour these thoughts into a framework to organize them, the insights they reveal are often remarkable. The story of my journey is a case in point. In 2005, after exiting my sixth startup, I was at a crossroads in my career – up to that point in time, I had spent two-thirds of my career with founder driven tech startups who were “on the napkin” and the other one-third as an entrepreneurial professor. I loved the energy and excitement of building startups and bringing something new and novel to the market, and I also loved the satisfaction of teaching and shaping the next wave of business builders. I didn’t know what the future held, but I did know one thing – I wanted to drive the bus and not be a passenger. During this time, my husband and I were planning a 10-hour drive to attend the wedding of a family member. We took along Jim Collins, Good to Great, on CD (yes, that was the popular medium at that time!). This book had recently been released and we thought it would be an interesting “listen” to eat into the bulk of the travel time. Just like walking in the woods, there’s something hypnotic about driving long distances in the car – your conscious and subconscious mind are relaxed and receptive to new ideas as you drive along staring off into the distance. It was here that I was captivated by the Hedge Hog Concept, and many the many other frameworks by Jim Collins that would later shape my future business. These three questions shaped the core of my business in 2005 and have continued to do so every year since. I carry the mental model of the Hedgehog Concept around with me to shape my thinking – especially as we ring in each New Year and also throughout the year as I contemplate growth options. I have used the Hedgehog Concept with founders of all types as a way to start the conversation about what they want to build. Founders, myself included, are guilty of focusing on what we are deeply passionate about, but we don’t always factor in the “best in show” and “making money” parts. 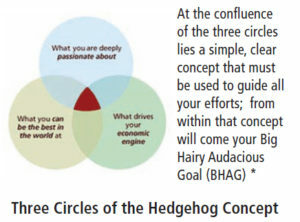 The Hedgehog Concept provides a framework to contemplate and consider where these 3 dimensions intersect. It is the intersection point that we’re looking for – that place where these 3 dimensions create a viable opportunity for a business idea – something you love to do, that you’re the best at it, and that you can make money doing it. How’s that for a power-packed triple!! The Hedgehog Concept will inspire many “A-Ha Moments” for founders who are ‘on the napkin’. I encourage you to use it with first time founders and also established entrepreneurs and company builders. It’s the perfect conversation to be having as we kick off the New Year, even if it’s just to remind and re-ignite the passion and purpose we have for our businesses! But my guess is that it will do much more than this. To everyone in our community of WKI Certified Coaches, customers, and followers – I wish you all the very best of health, happiness, and entrepreneurial success in 2019.